BELIZE CITY, Thurs. 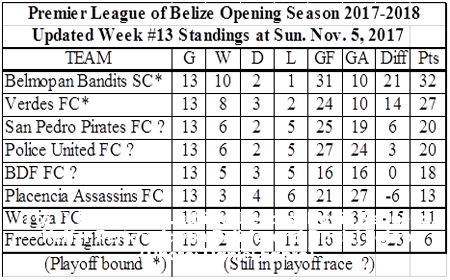 Nov. 9, 2017–The Premier League of Belize (PLB) 2017-2018 Opening Season regular season ends this weekend with Week 14, after which the top 4 teams in the standings go on to the semifinal home-and-away playoffs. Standings rank is determined first by points total, then goal difference, then total goals scored. Note that the start times for the three Sunday games below, previously 4:00 p.m., have been moved back to 3:30 p.m.